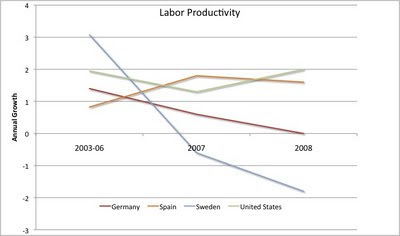 Below is data on labor productivity measured as GDP per hour worked in four countries… In the case of Sweden and Germany we can see that the fall in GDP has been much larger than the decrease in hours worked leading to a decline in productivity. In the case of the US productivity has remained stable. In the case of Spain the fall in employment and hours has been much larger than the decrease in GDP which has produced a doubling of the productivity growth rates in 2007/08 relative to the 2003-06 period. Indeed,… debt stands at $14.068 trillion or slightly less than 100% of GDP. Does this mean that the economy is doomed? There are two points that one has to take into account when evaluating the role of household debt in the economy. 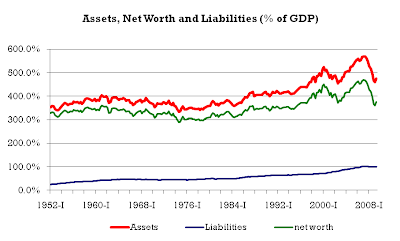 One Response to "Output, Productivity, Employment, Household Debt, Consumption, and Wealth"